Visitors will find extensive resources and an enhanced user experience at www.petsinomaha.com, www.bailingoutbenji.com, and www.dogbydogdocumentary.com. Omaha, NE., – Pets in Omaha and Pets in Des Moines, web-based magazines dedicated to adoption advocacy and uniting pet communities, is proudly sponsoring the premiere of Dog by Dog, which is to be shown at the Ames City Auditorium at 2:30 pm on August 9, 2015. Pets in Omaha, Pets in Des Moines and The Green Spot Omaha have partnered with Bailing Out Benji, an Ames-based non-profit dedicated to education and awareness for animal welfare issues, to bring Dog by Dog to Iowa. Dog by Dog is a documentary about the daily realities of puppy mills and the reasons they have been allowed to remain in business. The film is scheduled to be released worldwide later in 2015 and is travelling through the United States for special premiere events. Tickets are available for purchase at http://dogbydogdocumentary.com/iowa-premiere/ and seating is limited to 800. A question and answer session will be held after the showing and will feature Bailing Out Benji’s founder, Mindi Callison, Dog by Dog Director, Chris Grimes and representatives from Pets in Omaha/Des Moines and The Green Spot Omaha. For more information, contact Lee Legenhausen at (402) 639-5235 or email at lee@petsinomaha.com. 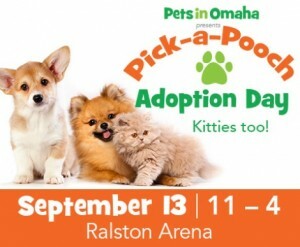 Omaha, NE., – Pets in Omaha, a web-based magazine has announced its second Pick-a-Pooch Adoption Day which will be held Sunday, September 13, 2015 at the Ralston Arena, 7300 Q. Street in Ralston. With the help of area shelters and rescue organizations, Pets In Omaha, will provide an interactive adoption experience as adoptable dogs and cats will be available to meet from 11 a.m. until 4 p.m.. The event will include raffle prizes, booths from area vendors and pet professionals. The event is family-centered and will build on the success of April’s event when over 30 adoptions resulted from the first-ever Pick-a-Pooch Adoption Day. Pets In Omaha invites pet lovers and media to come celebrate animal adoption and raise awareness of adoption opportunities in the metro area. The public event invites the community to attend as Pets In Omaha’s primary goal is to grow and strengthen Omaha’s pet community. Admission is $7 or attendees can purchase a discount ticket at Omaha’s The Green Spot and other local pet retail stores. Visitors 16 and under are admitted for free. Feel free to bring your well-behaved dog on a non-retractable leash. The online magazine seeks to become the area leader in everything pet-related and grow Omaha’s large philanthropic and active animal community. Sunday, September 13, 2015 from 11 a.m. until 4 p.m.
See our listing here and read about Metro Magazine at www.spiritofomaha.com. Pets in Omaha is a wonderful resource for the Omaha metro area. Started by a couple of guys who just “wanted to help” the animals, it has grown into a pet advocacy website that provides information, helpful hints, articles and event postings for the Omaha Metro Area. Pets in Omaha offers unconditional support to all rescues and shelters in the area and helps spread the word about each group’s mission and needs. They spotlight challenges facing animal welfare groups like pet over population and the need for foster care. They highlight animals needing special homes, and provide well researched articles geared toward informing pet owners about proper pet care. And they offer information on pet friendly events so pet lovers can get involved. Pets in Omaha provides “glue” to link up pets, people and animal advocacy organizations in one spot. They have even created a new event in the metro called “Pick a Pooch” that put everyone under one roof and provided a one-stop pet experience. The Nebraska Humane Society is gratified and proud to be affiliated with Pets In Omaha.com! April 12, 2015 – Several news outlets came to our event to see what we were up to! WOWT Channel 6 News, KMTV, the Ralston Recorder and FOX 42 were all there. Here are a couple of stories they published. 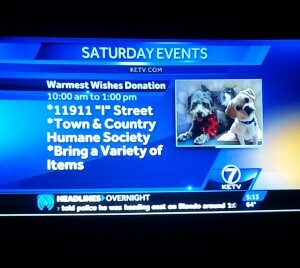 *Note- the WOWT story called our “Pick-a-Pooch” event “Pets in Omaha” and said it was sponsored by Omaha Magazine, both of which are inaccurate. The Pets in Omaha Pick-a-Pooch events are made possible through our own revenue and through sponsorship that we’ll give attribution to. We were listed as one of Metro Magazine’s 101 Things to Love About the Omaha Metro for 2014! 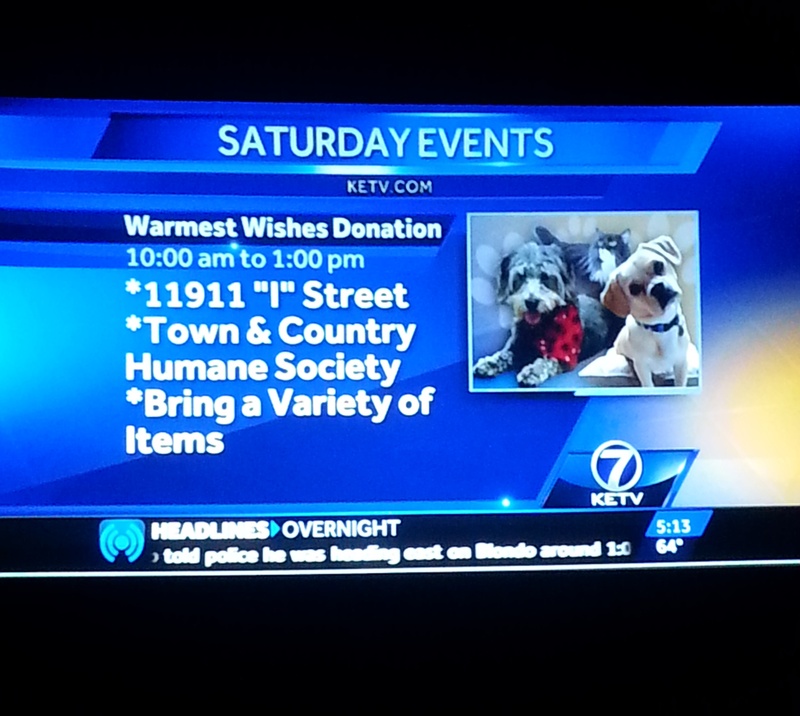 September 5, 2013- Here’s an article from Omaha’s NBC affiliate, WOWT6-News, announcing our official launch party at the Nebraska Humane Society.